I took the subway to transfer to the airport express line on my way back to South China for a R&R weekend. RMB 2.00 for the subway ride, RMB 25.00 for the airport express. Total about SGD 5.40 for the trip. This photo on the right is an interesting one that I took. You see these folks queuing orderly but fully blocking the boarding gate? Fret not, this is a terminal station i.e. the train will be empty upon arrival and so there won't be a situation where people cannot get out with them blocking the exit. But here's the strange thing that I was not able to capture on film. When the train arrived and the doors opened, only a small handful of people go in. The rest of the folks standing outside simply wait for the next train to board despite the train being relatively empty. Initially, I thought it was just a regular queue to get onto the train and so I queued behind them like everybody else. So to my dismay when I remained stuck at the back of the queue when the train in front of me pull out of the station unfilled. It took me a while before I understood what was going on. These people were queuing for a seat on the train. 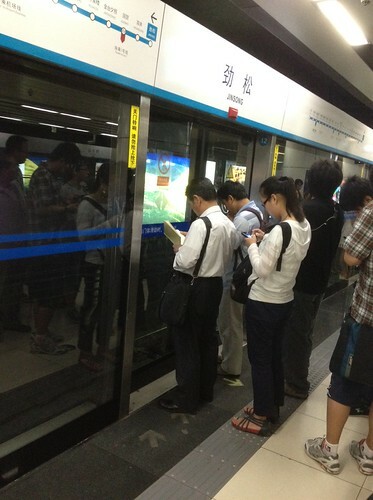 If all the seats are taken, they simply choose to wait for the next train. For people like me who prefers to stand rather than sit, you should wait at the side of the door, once the queue to stop entering the train, overtake the line to claim your standing space. I shook my head. Stand a bit will die one meh?